Do you want to use custom image sizes in your WordPress theme? With custom image sizes, WordPress will automatically generate your custom defined thumbnails for every image you upload, so you don’t have to edit images manually. In this article, we will show you how to add custom image sizes in WordPress. Sometimes your WordPress theme includes different thumbnail images sizes other than the default WordPress image sizes. In this case, defining custom image sizes will save you a ton of time manually editing every image thumbnail individually. Hit the Save button. This will enable the support of post thumbnails, so you can use the built-in function add_image_size() to add your own custom image sizes. Then, we designated the width and height. The first value is the width and the second value is the height for the image. Go ahead and customize these variables to whatever sizes you need for your particular theme. Change ‘your-specified-image-size’ to the name you assigned to your custom image size in the previous step. You’ll need to paste this code inside the post loop of your theme file. Then, repeat this process for any additional image sizes that you want to display in your theme. Even though you now have custom image sizes, these changes won’t effect any images that were previously uploaded to WordPress. So, you’ll need to go and regenerate those thumbnails. The easiest way to do this is with a plugin like Regenerate Thumbnails. It will regenerate all of your thumbnails to the new image sizes. Go to Plugins » Add New. In the search bar, type Regenerate Thumbnails. Then you will see the plugin. Click on the Install Now button, and then click on the Activate button. Once the plugin is activated, go to Tools » Regen. Thumbnails and click on the Regenerate Thumbnails button. Now, all of your previously uploaded images will have thumbnails that are the correct dimensions. In the above steps, we added custom image sizes to our theme files. Now, we will apply these custom image sizes to post content as well, using the Simple Image Sizes plugin. Simply go to Plugins » Add New. In the search bar, type Simple Image Sizes. The plugin will be displayed below. Go ahead and install and activate the Simple Image Sizes plugin. Then, go to Settings » Media and check mark Show in post insertion. Make sure to click on the Update button after every custom size. Now, your custom image sizes will be available for post content, so you can add photos into a post using your custom sizes. That’s all. We hope this article has helped you to learn how to add custom image sizes in WordPress. 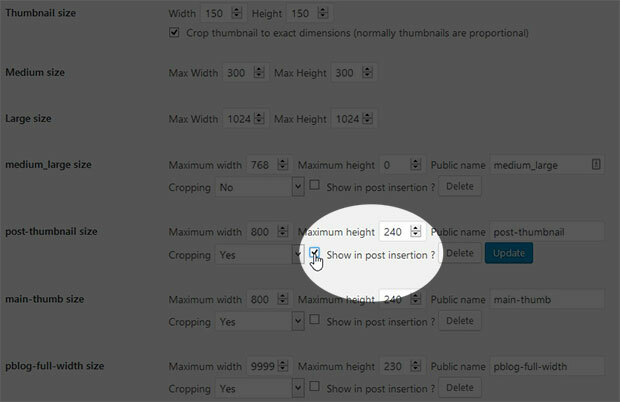 You may also want to check out our guide on how to resize WordPress images automatically. This is very cool. One question I have is if I add the extra image sizes as you suggest in step 2, will this then allow WordPress to choose which size to display based on screen resolution? If the site is responsive then the image size required would surely change for mobile, tablet and desktop. Apologies if this is too noob!